WordPress is the most widely used content management systems. Believe it or not, WordPress accounts for nearly one-third of all websites on the internet today. Because of the zero cost and open source structure, everyone from professional news organizations to the humble home blogger is using WordPress to manage our content. So how does one manage to make their content stand out? In a landscape awash with similarity, what draws one’s eye to one website over another? A good theme can take your content to the next level and get you noticed. Splashy themes, subdued themes, colorful or classy… whatever you are looking for can be found online. Themes make it easier for you to design your website around what you want your visitors to see when they visit your page. Your chosen theme will be the first impression they get about your site. It will cue them to the site’s atmosphere even before they begin to take in your content. Disclosure: Some of the links in this post may contain affiliate links. This is to help support our blog and does not have any impact on our recommendations. The best WordPress themes provide all of the basics such as page layout, content display options, and widget development. They will also cover design, with appropriate colors, fonts and style choices. Your theme decision will depend on what you are looking for in a website. If you want video, photographs or any other media sources on your page, your theme must be well tailored to fit your needs. Another key feature the best WordPress themes for blogging provide is the instantaneous link to your other media platforms. A website can only reach as many people as see it so linking to your other outlets is crucial. If you are developing your business site, you’ll want to direct visitors to your LinkedIn profile. Entertainment blog? Instagram, Twitter, Facebook, it all matters. As we approach the end of 2018, now is an excellent time to consider a fresh face for your website. As the theme is the visual presentation of all your hard work, choosing the right theme for your content is critical. With tens of thousands of themes available, how can you be sure you’ll find the best choice for your site? 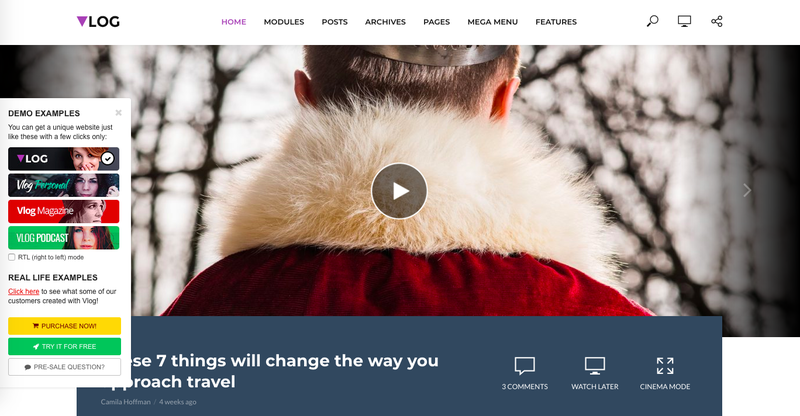 Here are the ten best WordPress themes for blogging in 2019. How many times have you wanted to move that widget a little to the left and when you did, it warped something else? Like a butterfly effect, you add in a few pixels here and if makes everything off balance “over there”. You know what you want your website to look like, except you’re a content creator, not a programmer. 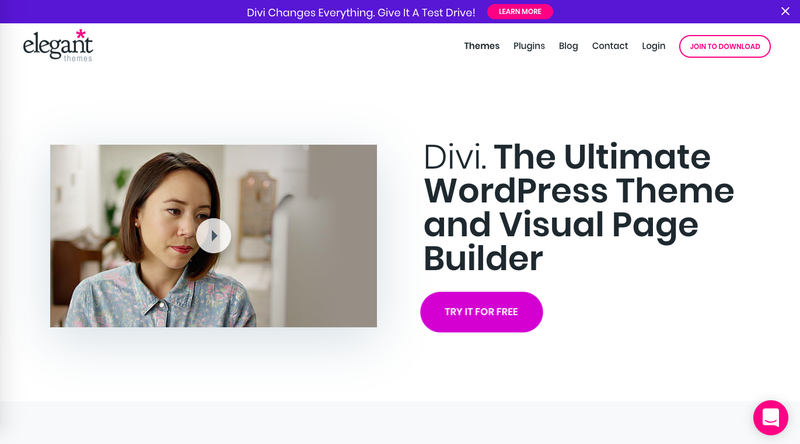 Divi lets you design, change and tweak your WordPress page in real-time. You can edit the visuals directly from the viewport. Additionally, you will be able to see the changes you make as you make them. This eliminates much of the trial and error of old. Fonts, colors, size, shape, titles… everything is customizable in this real-time responsive theme. Divi supports drag and drop organizing so you can make a change, see what it looks like, change your mind, or move on to the next tweak, all without time-consuming reload and refresh waits. Divi is a great theme for your evolving ideas. The Rosemary theme is a great choice for the blogger who doesn’t want their content to get mired down with a complicated looking website. The theme is bright and straightforward giving the reader a fresh slate to take in the blogger’s content. Multiple layouts allow you to choose how you want each post to be viewed. If the focus of this particular post is a spectacular photograph, choose a wider layout to showcase that image. Have a bevy of pictures from that latest adventure? Choose a gallery view for this post. Rosemary lets you customize the layout according to your post. The typography in Rosemary is elegant and clean. A nice tight font that gives the writer ample room to convey the story without feeling bunched up and busy. The subtle changes in the varying header fonts stay within the theme and allow the words to flow quite nicely. Rosemary is a clean theme that focuses on your content. Soledad is another clean theme with a classy look. It has a plethora of options available for image layout and feels like a natural fit for the photographer or visual storyteller. The photo slider is a wonderful main function on this theme. Soledad gives you forty built-in options to choose from. Large central photo, triple split, cascaded… You will find what you are looking for in their slider directory. And with the second and third column options, you can splash your front page with as many options as you desire. Have more focused posts where you may want fewer options? If so, you can opt for the single column to draw the reader’s attention where you need it most. With all these photo options available, your copy will not get lost among the art. The clear and concise font will communicate your meaning without taking over the page. Soledad is one the best personal photo blog themes available. Touted as a “feminine WordPress theme”, there is much more to The Essence theme than just a girly look. In fact, I found the theme pleasing and well-designed regardless of gender affiliation. The Essence appears to really thrive on the individual posts and articles. Magazine-like, the puts your posts right up front and allows the reader to pick and choose what they want to read without having to root through what they don’t. And along the way, one of your other posts may catch their attention and get them coming back. Slider option with photograph leads, strong headlines, bylines and date published makes The Essence a great theme for a blog with constant updates. When you have hundreds of posts in dozens of categories, it can be difficult to keep them organized. The Essence does all of this for you and keeps it easily accessible to the reader. For the busy blogger looking to keep their magazine fresh, The Essence is a great choice. The name of this theme says it all. 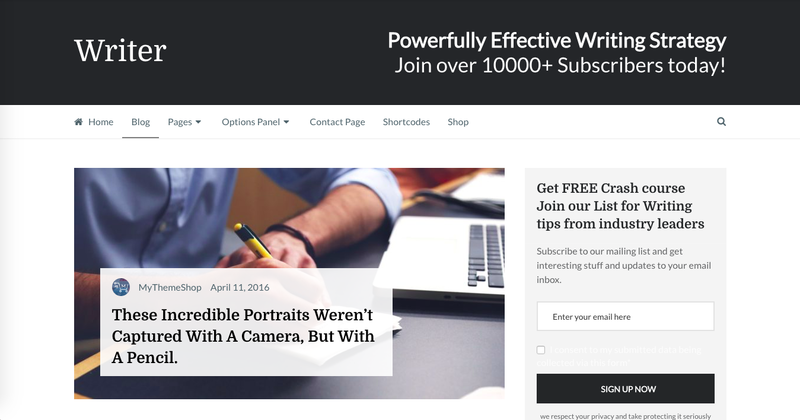 Writer is one of the best personal blog themes for writers. The first impression keeps a strong focus on story and article. It retains the personal aspects of blogging while delivering a professional outlet feel. And with a simple 1-click installation, you won’t have to spend your time worrying about the theme and can get back to your writing. Your content will get the punch it needs with bold layouts and captivating contrasts to grab your reader’s attention. The intuitive flow from photograph, headline and then a sample of the article will give your readers the chance to sample multiple posts without moving on to another page, give them time to explore your site and to read your content. Whether you are writing poetry, fiction, hard science or news journalism, the Writer theme is going to present your text in an exposed and bold format that is easy for the reader to consume. Don’t allow yourself to be overwhelmed by the Newspaper WordPress theme. When you need options, Newspaper delivers. Some bloggers are looking for a static theme, some are looking for a handful of options, but if you are looking for just the right options and a well-designed theme, look no further than Newspaper. This theme has over 400 layouts to select from and allows you to create a dynamic website that engages your reader at first glance. Newspaper lets you do as much or as little as you need in designing your website. Each one of their highly customizable layouts are perfect to get started with, all you need to do is choose and make it yours. Fast-paced and professional looking, Newspaper will give you that competitive edge you are looking for. On par with local and national new sites, Newspaper will impress your readers and give your blog that professional news appearance. Typology is best described as non-committal minimalist. The beauty of the written word takes center stage with this theme with large accentuated titles and the flow of the content below. This theme really focuses on the text and doesn’t distract the reader with flashy pictures. However, just because it markets itself as “A beautiful blog with no images required”, Typology does have some wonderful image options for those times when a picture really is worth a thousand words. Each of the three layouts are fully customizable and ready for you to post your content to reader’s ready environment. Blog, calendar, and preview, each of these are available with images as well. For a wordsmith looking to convey meaning through content, Typology is one of the best blogging themes available. Clean and minimal, it grants the reader a calming frame in which to absorb the words and focus on the text at hand. I see the CheerUp WordPress theme and I immediately get a glimpse into the author’s style. Dazzling front page dynamics with lots of photos and options to click on, CheerUp is an excellent theme for the blogger looking to build up their brand. Personal identification is key to standing out in the blog world. The blog that stands out from the others is recognized most. CheerUp’s theme draws attention and maintains focus on your brand and information. Full of vibrant pictures and descriptions, you have a blog theme here that really brings your ideas to life. More than 200 layouts and five featured slider options, you can create your website to reflect the image you want your readers to see. CheerUp offers a modern look and a genuine peek into the blogger’s identity. 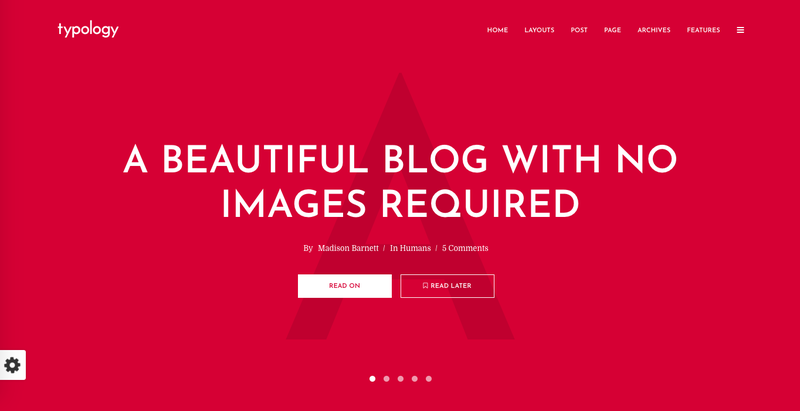 Customized headers and a full array of layouts makes this one of WordPress’ great themes for blogging. Are you thinking of venturing into the world of video blogging? If so, the Vlog theme is a great theme to get started with. Why spend your time adapting your old theme to accommodate your videos when you can start 2019 off with a brand new face-lift to your website. This is all dedicated to showcasing your video blogs. Let Vlog make it easy for you with automatic video importer from YouTube and Vimeo, easily embed videos from anywhere, and generally enjoy the ease with which Vlog handles the videos you post. Design your site with some of the more than 200 layout and post options. Then, let Vlog take it from there. Visiting your website and watching your content is a smoother experience for your viewer with Vlog. They can mark videos for later or even pop out the video and watch it in cinema mode, focusing on just you and your video. Vlog is a great theme to begin video blogging and a great way to experience your content. SEO WP is a monster WordPress theme. Utilizing this theme provides top-level designs that are built to push rankings higher in search engines. Backend coding optimization speeds up the theme, makes it far more efficient, and ensures traffic is moving. The layouts are professional and can turn any of your online marketing or social media accounts into top-tier websites. The click of a few buttons in the custom design manager and your content is transformed into an executive presentation ready for any boardroom or business venture. SEO WP receives regular updates, access to premium plugins and readily available customer support. All of which will keep this theme up to date and ensure your website keeps performing at its best. SEO WP is a must-have WordPress theme for the blogger looking to take their ideas to new heights. There are countless themes available for WordPress. All of them make it better for you to properly display your content on your website. Choosing the right theme depends largely on who you are, what your content is, and how you want that content portrayed to the viewer. We have covered a wide variety of themes here. Among this list, you will find the ten best WordPress themes for blogging in 2019. Themes like SEO WP, Newspaper and Divi are highly powerful. They are perfect for those that want to tweak their pages for high visibility design. Others like Writer, Typology, and Rosemary are more subdued and gentle, less visually striking and more focused on content. Your tastes, personality and of course, the content itself will dictate your theme needs. In the wide range, we have covered on this list, you will find the theme that best fits your website.